Karinya (aboriginal word for “peaceful home”) is a beautiful, cosy mountains cottage in Mount Victoria. It was built in the 1920’s and has been renovated to retain its old world charm and to provide all the modern conveniences. 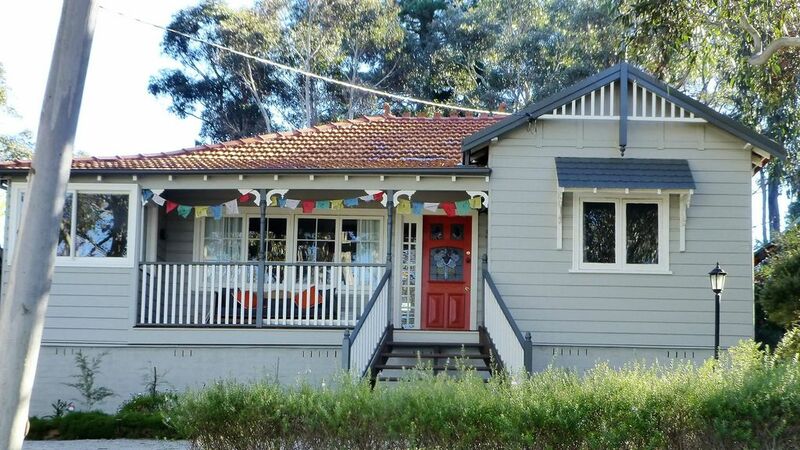 Karinya is set on the high side of a quiet street with views towards Kanimbla Valley. It is open, light filled and very relaxing. Perfect for a family or group of friends who just want to soak up some mountain atmosphere. It has 2 double bedrooms and the old veranda has been built-in to provide another bedroom with single beds at either end. Linen is all provided so just unpack and settle in. The living area has 2 couches, a TV and DVD player and lots of games. The kitchen has all the amenities that you might need – microwave, oven, lots of utensils. Relax on the back veranda and soak up the sun while you watch the kids play in the fully fenced backyard, or sit on the front veranda and watch the colours change as the sun sets in the Kanimbla Valley. Stroll up to the Village for a lazy breakfast at Petalura, cruise around the various gift shops or watch a movie at the Mt Vic Flicks. If the aim is for more activity, there are numerous walks from the front doorstep or for rockclimbing, canyoning or mountain biking the locations are endless! Ask for details on secret locations or guide books. Karinya is the ideal starting point for a visit further west and to Jenolan caves. Blackheath is a few minutes drive away with its shops and restaurants or visit Katoomba with its tourist attractions like Scenic World, the Three Sisters and Edge cinema. After all the sightseeing, Karinya will be waiting for you to unwind again! A beautifully relaxing home with lots of attention to detail. We loved our week here. It had everything a family with kids needed to have fun and relax. Beautiful garden and the king parrots were a favourite with my boys! Thanks for leaving seed so we could have fun with them! Everything was clean, lots of thought put into what we might need and a lovely gift of biscuits and wine on arriving. Fun for parents and kids alike. Thank's for letting us use your home. Lovely cottage. Perfect for a long weekend. It has everything you need and more. Lovely comfortable cottage in a lovely spot. We had a fantastic long weekend very impressed as the cottage was clean and well appointed with a great slow burning fire to keep us cozy! Thank you for your hospitality! The house is gorgeous and spotless clean! We loved it so much! Rod and Helen are amazing hosts! My friend and I stayed in Karinya for a couple of nights and absolutely loved it. It was cozy, warm and there was plenty of firewood - it had everything we needed. It was very easy to find and the location was great - so close to a lot of walks. One night we walked down to Sunset Rock right down the road which was beautiful. Rod and Helen are very helpful and even kept us updated on the upcoming weather! Son (11): Loved the chess set; beat dad for the first time. The bed was cosy. Daughter (11): Clean toilets. Nice back yard. Family Boggle champion. Daughter (9): Nice kitchen. Loved the LEGO; lost at Boggle. Me: Fireplace was a winner. Plenty of logs kept us warm. Great size house, awesome location. We visited local cafes, shops & walks. Dinner in Blackheath. Rod is a great host.